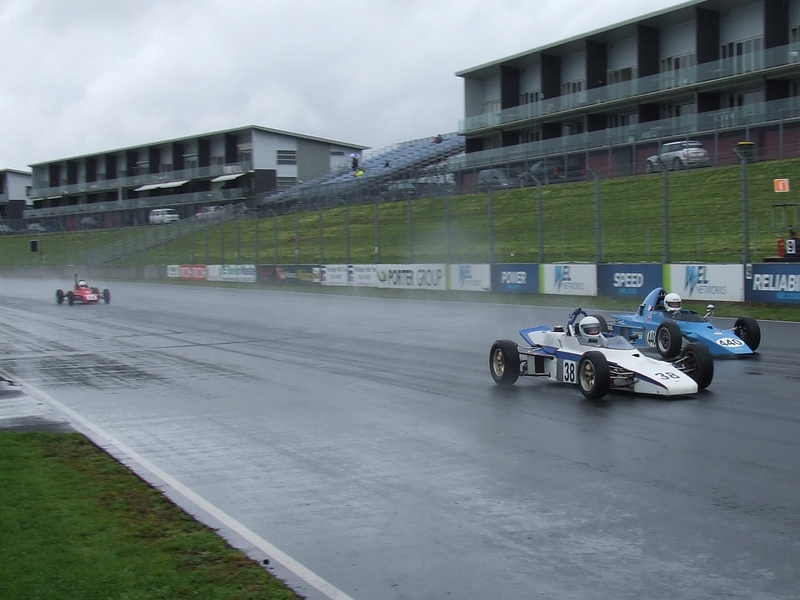 Well it was a blustery weekend that saw cars take to the track in the first round of the Avon Tyres Historic Formula Ford Championship. A modest turnout of 13 cars formed the grid, having lost Paul Dold (GLH # 74) the day before thanks to some clutch issues. Saturday was not the warmest on record, and everyone had an eye to the skies wondering when the first drops of rain would fall. For practice, Grant Campbell stoked his Swift around the track, and posted a 1:13.931 – an early indication that on a hotter day, he is set to go sub-73’secs early on for this season. On his heels was Dave Silverton running on balding rear tyres at 1:14.520, edging out Ben Field in his Mark VIII Elden who posted a 1:14.608. 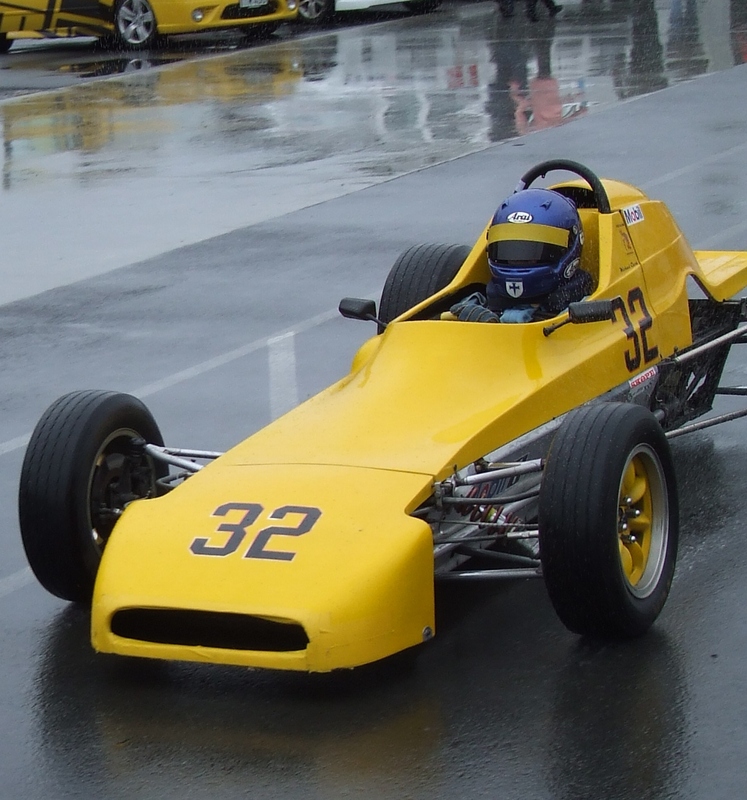 The first race was run in cold and windy conditions, with Brent Main (Keram #34) a non-starter thanks to a gear shift selector problem. At lights out Grant Campbell shot off for the lead, closely followed by Dave Silverton, Ben Field and Michael Clark (Crossle #32). Ben got around Dave on the second lap and set about chasing down Grant, however a late race mistake let Grant off the hook and Ben had to settle for second. Dave by this stage had fallen off the pace and started to drift towards the fourth place of Michael Clark. However MC was most likely contemplating other peoples famous fourth place drives, trying to ascertain if Fangio had looked as comfortable in fourth as he now found himself. Whatever is was, Michael stayed in fourth all the way to the line. A little further back and Lindsay Porter was putting on his best Trulli-Train impersonation, keeping no less than four cars in tow behind him until the last few laps, whereby the three Lola’s in the field (T342 of Chris Fraser, T440 of Ian Staples, and Lindsay in his T644) did a casual reversal of placings, in so doing, letting Phil Major in his Spartan (#133) to sneak through. 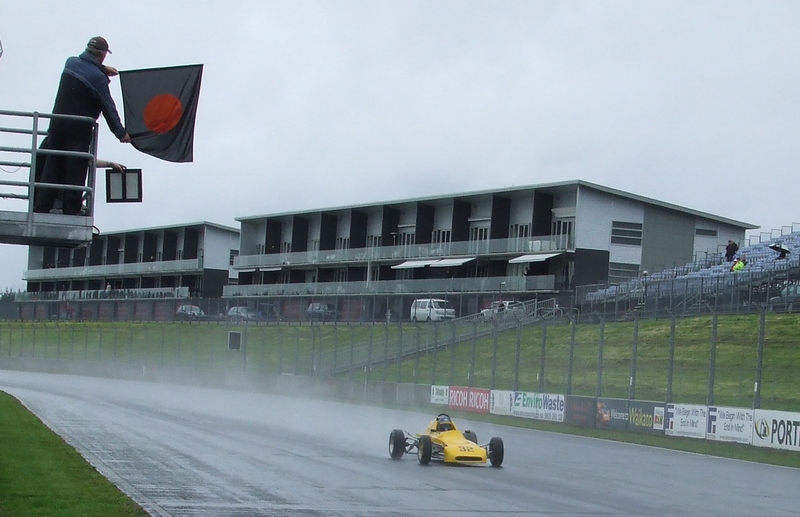 Race Two was held on a wet track – the skies had opened up over night, and had kept drizzling all morning. The sedan’s had done the best they could to create a dry line, but the rain god’s were having none of that, and proceeded to wash whatever line appeared away. And so it was, the race started under “wet track” conditions. Michael Clark decided that rolling starts were a good idea, and was casually heading for the first corner long before anyone else – however when the lights went out, and the clutch was dropped, he managed to reverse all his gains by spinning the back wheels and going nowhere fast. MC would have us all believe that he did not jump the start, and simply “started outside his box”. With the spray going high, the cars soon spread out and Ben Field was off the front with a clear view in front of him. The two Clarks, Michael and Vic, both served a mechanical black flag. In MC”s case, the stewards were probably all too aware that this was the man renowned for losing his exhaust pipe, and for losing his wing mirror out on track, so they figured this warranted a mid-race nut and bolt inspection. ….and serves his Mechanical Black Flag after stewards determine that all bolts and nuts are tight. Gerald Duncan in the Cheetah (113) had a decent first lap, finding himself in second place at lap end, with a hard charging Mike Hunter in his Hawke (#85) right on his tail pipe. By the end of the third lap Mike was through, and the next car eyeing up Cheetah-stew was Dave Silverton having had a bad first lap. On lap four, Dave was into third, and there they all stayed to the flag; Ben for first, Mike second, Dave third, and Gerald fourth. Behind them, Lindsay led home a Lola-trio as he finished 5th, Ian in 6th and Chris Fraser, 7th. Brent Main finished in 8th and was the last car on the lead lap. 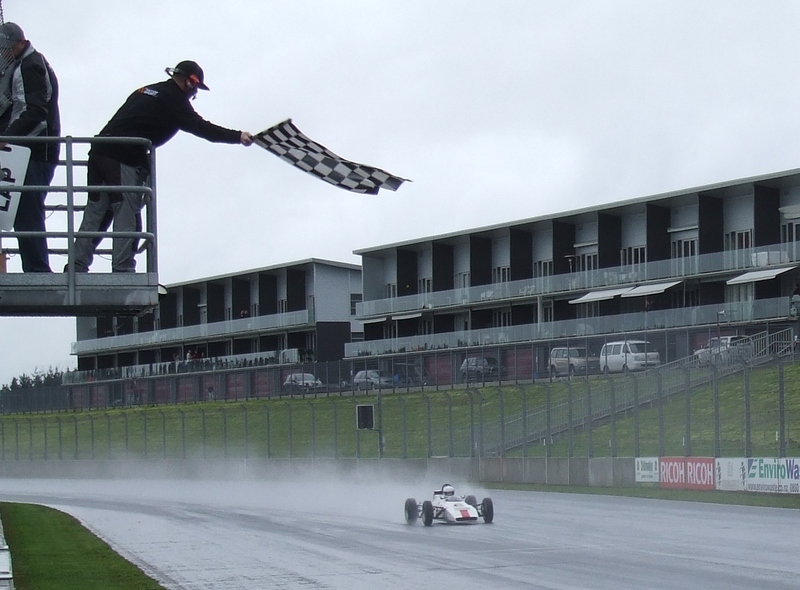 The final race of the day was held on a dry track, with lap times tumbling back down to the 74-second mark. Many drivers set faster laps in this race than any other of the weekend, thus garnering 6-bonus points in the Minor Series. A heated battle ensued at the front of the pack. Ben Field, ever present, led at the end of the first lap – however, that Marmon Wasp rounded out the second lap in first place!! Ben was having none of that, and slotted back into the lead for the next five laps, with Michaels’ Clark and Hunter keeping him honest. And then, somehow, he did it again…The Right Honorable (some say) Michael Clark snatched victory out of the palm of Ben’s hand, crossing the line a mere 0.160-secs to the fore, and in so doing, won his second ever race. Mike Hunter was a mere 0.151-sec’s further back on Ben, and took a well deserved third place. So in conclusion, it was great to see the Wellington boys at the track again -welcome back Ian and Phil; great to have you out there lapping again. It appears that this year will be a tight tussle at the front between a hard charging Michael Clark, Mike Hunter, Ben Field and Dave Silverton, with several others not too far behind. Certainly the midfield has closed up from last season, so it will be interesting to see who improves over the season. In the minor series standings, Lindsay Porter has a one point buffer over Ian Staples, with Vic Clark in third. Most people improved their fastest lap times over the course of the weekend, which is great to see. Next up is the one-dayer at Pukekohe on October 6th.